- 10 % discount for all reservations confirmed and paid until 31 October 2018! Location: The four-star Club hotel “Yanakiev” is one of the newest and most-comfortable hotels in Borovets mountain resort. 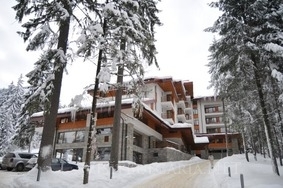 Its unique location, right on the ski slope and the surrounding forest full of old spruces and fir-trees makes you feel an unbelievable combination of tranquility and beauty right in the heart of the resort. The numbers of facilities, which the hotel offers to its clients, such as modern equipped ski center, swimming pool with perfect view to the ski slope, SPA center and many others, will make your holiday an unforgettable experience. The smiles, the gentle and careful service of our personnel will make our clients feel one-and-only. Accommodation: Club hotel Yanakiev has 34 double rooms and 6 apartments. All of them are equipped with balconies with beautiful view either to the mountain or to the center of the resort. Spa & Wellness: The SPA center is situated on the ground floor and on the mezzanine. It has a steam bath, laconium, sauna, ice corner and a big department for various types of massages. The swimming pool is uniquely situated on the level of the ski slope passing by the hotel. The swimming guests of the hotel could enjoy the skiers on the slope. The ski center of the hotel has brand new modern skis and ski boots and could serve all the guests of the hotel. Wine & Dine: The restaurant opens out a beautiful view towards the ski slopes of the resort. The lobby bar and the evening piano-bar offer nice atmosphere and warmth for the hours after the active sport. For the most enthusiastic skiers and other guests who want to have quick lunch without losing much time a fast-food restaurant is established in the left end of the hotel. You can enter it right from the ski slope and if the weather is nice you can enjoy the lunch on the sunny terrace. The hotel has an open and indoor parking area. Conference facilities:A small conference room gives opportunities for business seminars, meetings and conferences.